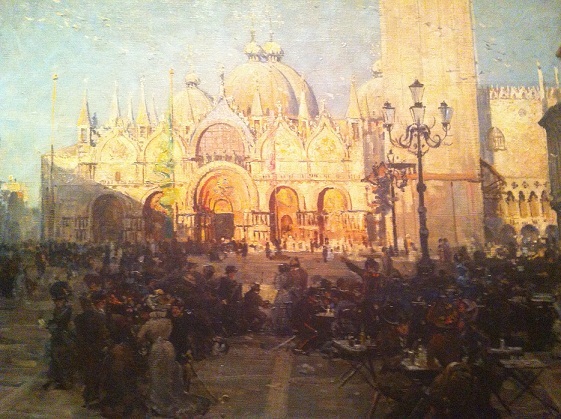 I was at the Queensland Art Gallery in Brisbane a few weeks ago and I was thrilled to stumble across this arresting work by Arthur Streeton, St Mark's, Venice (1908). And here is a closer view of the work.. I didn't want to walk away from this painting. Sir Arthur Streeton (1867 -1943) is one of Australia's best known and best loved artists. An Impressionist painter, Streeton and his bride Nora Clench visited Venice on their honeymoon in late April 1908, and they returned again in September/ October of that year. (Note that 1908 is also the year in which an elderly Claude Monet arrived in Venice for the first time). Streeton’s stay in Venice was productive: after painting and sketching en plein air in Venice, he undertook further work back at his London studio, eventually creating up to 80 paintings. Streeton depicted typical Venetian scenes: Piazza di San Marco, the Basilica, the Bridge of Sighs, the Rialto Bridge and the Grand Canal. “I have worked two afternoons lately in the centre of the Piazzo San Marco - & got in good one 40.24 – It took some nerve too – it’s in heart of the city & always full of people – so while Mrs S. sat some yards off on a seat at the ‘Florian café’ reading ‘Great Expectations’ I sat surrounded by a great mob of about 40. It was extremely hot with so much humanity like a wall round me a wall of 4 feet thick & all 98 temperature made me perspire – I’ve seen no one else tackle it here – But I pulled it off. Also I’ve painted one 66 X 36 from the top floor of Palazzo Foscari – commanding a fine view of the ‘Grand Canal’. I’ve done several others also, & shall work on these as soon as I get back to the Studio and shall pick out a few to send to Melbourne for a trial. …Miss Clara Mustalba lives in the Zattere and was kind enough to get me permission to paint from ‘Foscari’ – she is a good artist and has done splendid things of Venice". 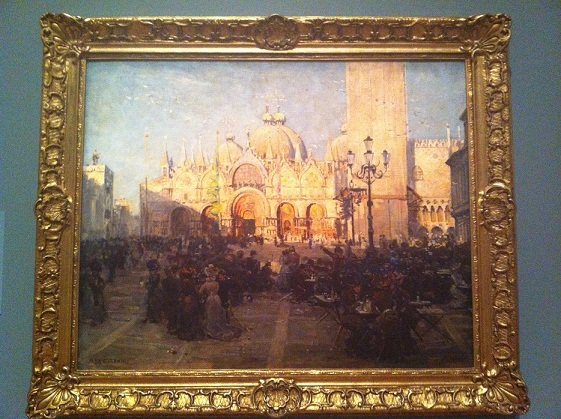 Streeton included a sketch of San Marco in this letter, and beside the sketch, he wrote ‘all gold and yellow & blue’. 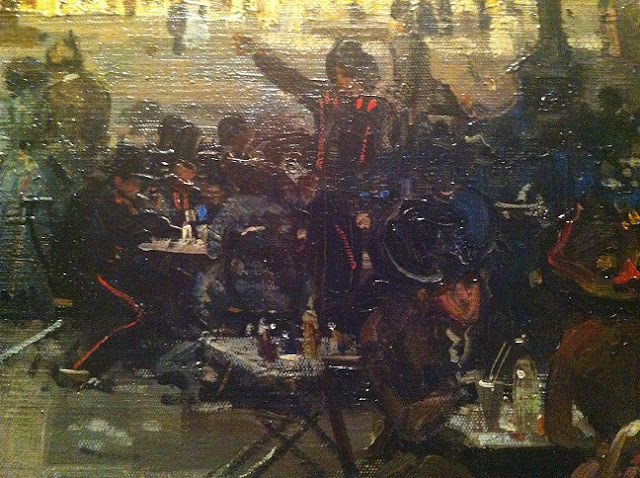 In April 1909, Streeton exhibited some of his 'Venice' works at the Alpine Club in Savile Row, London. 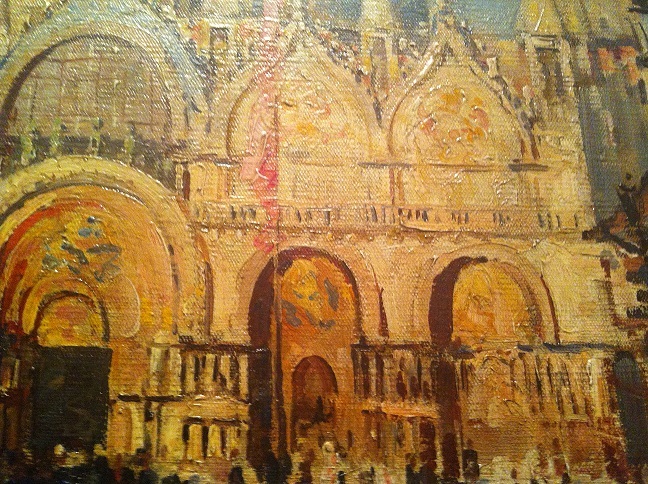 ‘Mr Streeton has caught the opalescence and glitter of the Venetian canals and marble palaces in moments of bright sunshine as few artists have done before him… What is more the Australian painter has not confined himself to a mere architectural record, but makes us feel that Venice has retained in our days a certain something of the spirit which in the eighteenth century made it the pleasure ground of Europe'. I'm now on a mission to experience Streeton's other Venice works which are in public collections such as the Art Gallery of NSW (Sydney), the National Gallery of Victoria (Melbourne), Carrick Hill (Adelaide) and the University of Melbourne. And in the meantime...can anyone please tell me more about 'Palazzo di Biasi' on the Zattere, where Streeton lodged during his stay in Venice? Venice is a crown jewel of the North Italy. Even Milano cannot be compared to its beauty and glory! Basilica Di San Marco and Piazza are my favorite sightseeing spots in Venice! 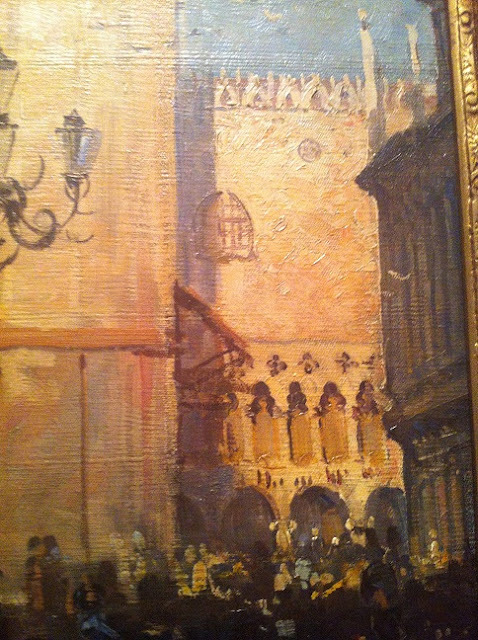 It may be odd that Streeton painted the Campanile in that painting, since the original collapsed in 1902 and the new one was not finished until 1912. I don't know how far the rebilding would have got to in 1908. Thanks for your review and the photos. The latter would have done greater justice to the painting if you had 'squared ' it properly in the cameras viewfinder. Seriously? A lovely blog post about wonderful paintings of a beautiful city, and that's the most important point you need to make? Thanks Capturing Venice for a great post that makes me go and re-look at paintings of Venice. Don't listen to carpers!